All bats have a 30 warranty. Claiming your warranty is a very simple process. Follow the steps below to get started. First navigate to your account page. If you're not already logged in you'll be asked to do so then you will be redirected to your account page. On your account page there are two links that take you to your list of completed orders, on in the main content and another in the left sidebar. Note: your orders status bust be complete in order to be eligible for a warranty claim. On the Completed Orders page you can see list of all of your previously completed orders. Locate the order your wish to claim by order number. 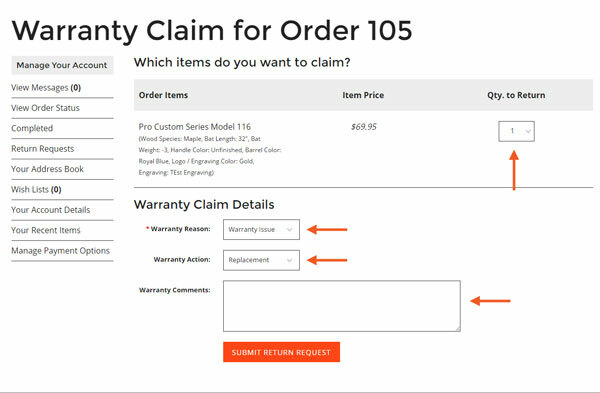 Begin the warranty claim process by clicking the black Return Item(s) button. Using the dropdown boxes, indicate which items you wish to claim and their quantity. After that answer a few quick questions, explain your claim and click the orange submit button to send off your claim. Within a few minutes you will receive an email confirming that we received your warranty claim. Use the information provided in this email to follow up on the warranty claim process. As always, if you are experiencing any difficulty or have questions don't hesitate to contact us via the form below, phone or email.